I have fallen woefully behind on the ABC Along. I am just now getting to H and I think I’m supposed to be on L. Hillary assures me that I can catch up so I’m going to give it a try. Besides, a perfect H fell into my lap. Actually, this perfect H started when something else fell. Namely, the top of a flag pole. A cast iron top weighing 6 lbs. I’m sure you recall the incident. And I’m sure you recall the spectacular bruising that resulted. Need a reminder? Pretty gross. 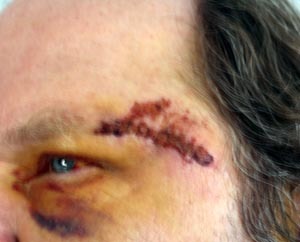 However, a few of my readers suggested that those colors might be prettier as yarn than as part of my husband’s face. So I asked my good friend Scout if she was up to the challenge of dyeing some yarn to match Dale’s black eye and of course she was. Isn’t it awesome? We batted a few names back and forth but I think Heads Up! is the perfect name – and a great reminder to look up when you’re doing stuff like raising a flag because you just never know when a flag pole might fall on your head. I think the colors are a perfect replica of Dale’s bruise, too. 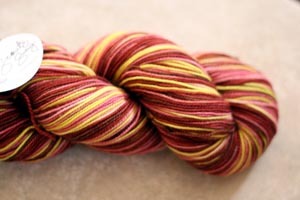 And you guys were right – those colors make very pretty yarn! I just know it will make even prettier socks. And I just know you all want some, too. Go see Scout and get some Heads Up! for your ownself. Tell her Carole sent you. 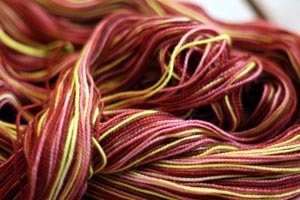 The colors are gorgeous…better in yarn than on Dale’s face! I love that! Making lemonade from lemons! Definitely prettier as yarn than on Dale’s face! The yarn is pretty…but sorry to say not Dale’s eye wasn’t! Glad he’s all better now and you have a yarn to commemorate the flag raising snafu. Oh look at it next to that picture! It looks just like it! I swear I’m crazy sometimes and way too hard on myself. I’m so glad you like it! Yes…much better in yarn than on his face. I’m glad that’s behind you! The yarn is great! An unusual inspiration for sure, but the yarn turned out beautifully. Talk about taking lemons… Lovely yarn! OK – please, I just got out of bed after three days and this is what I find. Damn girl – I knew this was going to be a GREAT day!! I does look better as yarn and I thing I’ll have to get some. Do you remember the character on Saturday Night Live – Massive Head Wound Harry?? Oh, boy! Pretty yarn but I’m just not sure I could get over the source of the inspiration – makes me a bit woozy :)! But glad to hear you are on I – I thought I was bad just doing J.
I can’t decide if that’s extreme ingenuity or an example of our obsession, but it’s pretty either way. Talk about making lemonade! What a great collaboration… is Dale going to get any royalties? I am impressed with just how appealing this yarn is. As for the ABCs – I have been playing catch-up all along, and am still struggling to come up with my “H” post, so now you are ahead of somebody, LOL. The yarn colors are perfect! She really captured them, and turned them from something pretty scary into something very lovely! Oh, the colors are much better as yarn than on Dale’s face. Poor guy. And now he’ll have the event forever documented in sock yarn. 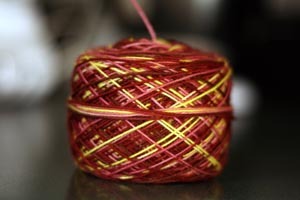 What pattern are you going to use for the lovely and colorful yarn? You’ll catch up, Carole. You’re not that far behind. That is SO funny. And I thought doctors were the sickos. The yarn – gorgeous! Dale’s eye – was pitiful! Funny how we can turn things like a bump on the head into something gorgeous!!! Have a great week-end, I’ll catch up with you when I get home. When I saw the picture I was afraid it had happened all over again. Love the yarn. wowee!! what an awful gash… glad Dale is okay! the yarn is beautiful. It makes me laugh that Dale’s injury was made into a yarn colorway! I do hope it is healing up! OMG Carole, I am laughing and laughing… At first I had a moment of panic for you that Dale had hit his head again, but the yarn, it is beautiful AND a PERFECT match! That Scout is one talented woman. I *love* the name. Too cute! I’ll admit to not be perfect in many ways, but one place I fall short occasionally is in returning my library books on time. I think I just love having them around too much and am reluctant to let my new friends leave. However, I have never nor will ever ask for a fine to be waived. I figure my money is going back into the library so what’s the big deal. However, I probably should return my books on time and just make a donation instead. That is the effin’ funniest thing I have seen in a long, long time. AWESOME. You are too funny!! Those colors most certainly look better on yarn than on Dale’s face! As for Scout, she is a wonder with the dyes! Wow, it really is pretty as yarn!